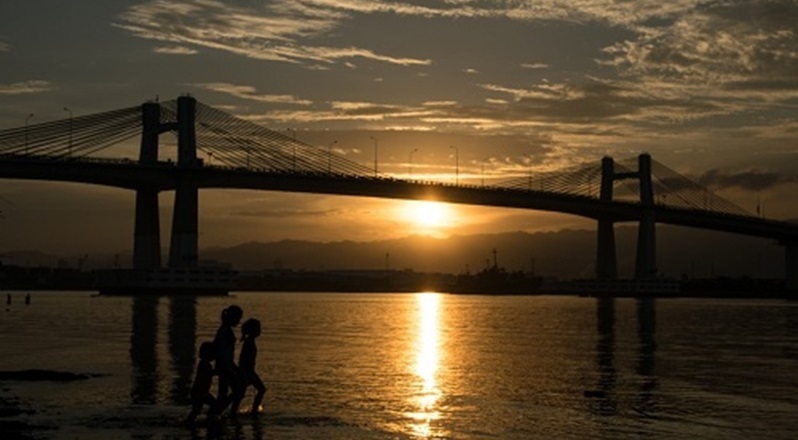 This photo of the Mandaue-Mactan bridge project against a sunset backdrop by Paulo Andrada is a runner-up entry in the Japan International Cooperation Agency (JICA) photography competition in the Philippines. TACLOBAN CITY — The Japan International Cooperation Agency (JICA) has kicked off the study of the proposed long span bridges that would link Southern Leyte to Bohol and Surigao, the Department of Public Works and Highways (DPWH) said on Wednesday. The JICA survey team arrived in Southern Leyte on Monday to check Guadalupe village in Maasin City and Benit village in San Ricardo town. Benit has an existing port that serves as the region’s exit point to Mindanao while Guadalupe is the nearest point in Southern Leyte to Bohol Island. DPWH Southern Leyte Office chief Ma. Margarita C. Junia said this could be the initial step in the realization of one of President Rodrigo Duterte’s ambitions to connect Leyte to Bohol and Mindanao islands. “This is not yet part of the actual feasibility study, but their findings will help the DPWH determine proper measures to be undertaken before drafting the project’s detailed plan,” Junia said in a statement. The Leyte-Surigao project involves the construction of cable-stayed bridges with a length of 23 kilometers connecting San Ricardo, Southern Leyte and Lipata in Surigao City, crossing the Surigao Strait. The Leyte-Bohol bridge is part of the long term plan to connect islands in the Visayas Islands. The proposed bridge will start in Ubay and President Carlos P. Garcia towns in Bohol to Maasin City in Southern Leyte. Earlier, the research team conducted similar initial studies in Iloilo, Negros, Cebu and Guimaras as sites of high impact bridge projects in Visayas. JICA is a long-time development ally of the Philippines that provides technical and financial assistance in the country’s development projects with the goal to sustain economic growth and promote human security. Last month, Southern Leyte Rep. Roger Mercado filed House Bills 6755 and 6756, asking the government to fund the construction of said bridges. The proposed legislative measure mandates the DPWH to include in its annual budget under the General Appropriations Act the funds necessary for the proposed construction of Leyte-Bohol Bridge and Leyte-Surigao Bridge.